I know someone (neighbor, friend, relative, etc.) who is hitting/hurting/refusing to give food, water or shelter to their dog/cat, not bringing their pet to a vet and it really needs medical treatment. What can I do? I don't want them to know that I complained about them to PAWS. Thank you for taking your time in reading my email. I would just like to ask for enlightenment. I have this neighbor (quite far from our place) who has this dog chained on their windows. I just noticed that the dog is getting really thin as if it is being starved to death. Before that, the house beside this "cruel neighbor" also has a thin dog with the same condition. I fed it once and notified the owner of the house regarding the cruelty. After two days, I've never seen the dog. Tonight, I will visit and hopefully feed the dog when I get back from work. The people here are not really friendly and the police are unreliable. Will this kind of act (starvation of animals) has good chances to be resolved? If the dog is within the property of the suspected animal offender, "starvation" and other neglect is one of the most difficult things to prove. Several times we have already knocked on doors and checked and the owner simply says that "reports aren't true, dog is being fed, dog is just sick, dog doesn't eat much, etc"
If the approach isn't a friendly one initially made by a friendly neighbor (i.e bringing in food to share in the guise of having a birthday party and just 'steering conversation into' condition of the dog) or if someone of authority suddenly knocks on their door without an initial friendly intervention, the more likely the dog will 'disappear'. Offenders know that the dog is the most damning piece of evidence and will try to hide or transfer the animal in a place where it can't be seen. In which case, we would have to have an affidavit of a neighbor willing to testify at all court proceedings that the dog is being starved and try to secure a warrant. Note: PAWS does not have legal authority to confiscate owned animals who are neglected or abused. This has to be coordinated with police and proper charges have to be filed in order for the animal to be taken out of harm's way. Without a written affidavit and witness willing to come forward, PAWS cannot forge ahead with further legal action. PAWS is not like animal cops or SPCAs you see on tv - those orgs have funding from their govt and support from their police. In truth, the proper government agency that should receive these reports and who has the authority to take action regarding animal welfare concerns is the Bureau of Animal Industry - Animal Welfare Division - tel. # (02) 926-1522; Office of the Director tel. # (02) 926-6833 / (02) 928-2429. Please let us know if you can make a friendly approach. If not, please be prepared to execute an affidavit stating that you have personal knowledge that the dog isn't being fed (i.e. state circumstances why you know this) and submit to us. A third option would be for PAWS to send a warning letter, but from experience, this 'spooks' the owner and also results in a "disappearing act" for the dog. We would recommend trying the friendly approach first. If the owner can be educated about responsible pet ownership (*please be careful not to sound as if you are reprimanding the owner when you do the initial approach), it is the dogs that will benefit from your diplomatic approach and you will get all the information needed for a complete report. The first line of aid for the neglected animal is YOU - the informant/concerned citizen. We expect all informants/concerned citizens reporting to us to take proactive steps in order to help the animals without waiting for PAWS' response, since you are already in the location where the neglect is occurring. 1. Try the friendly approach. Example: Offer food and/or water. Offer to help build a proper shelter. Offer to help bring the animal to a vet -- For Metro Manila cases: The PAWS Clinic is a low-cost clinic open for consultations from 1:00-3:00pm on Mon-Tues-Thurs-Fri-Sat except holidays. Other low-cost clinics are UP Vet (in Diliman), PSPCA (in Recto) or the city vets. For those in the provinces, approach your City Vet Office for lower cost vet services compared to private clinics. Enlighten pet owner that neglect or cruelty is a violation of The Animal Welfare Act (RA8485) and that it would be better if he/she can improve pet's living conditions so as not to be charged. PAWS is a volunteer-based organization so we do use the barangay a lot (Barangay officials, unlike PAWS volunteers who are unpaid and have regular day-jobs, are mandated to check on violations of the law - a way of making your taxes work for you and impress upon government officials that animal welfare concerns are important to their voters). 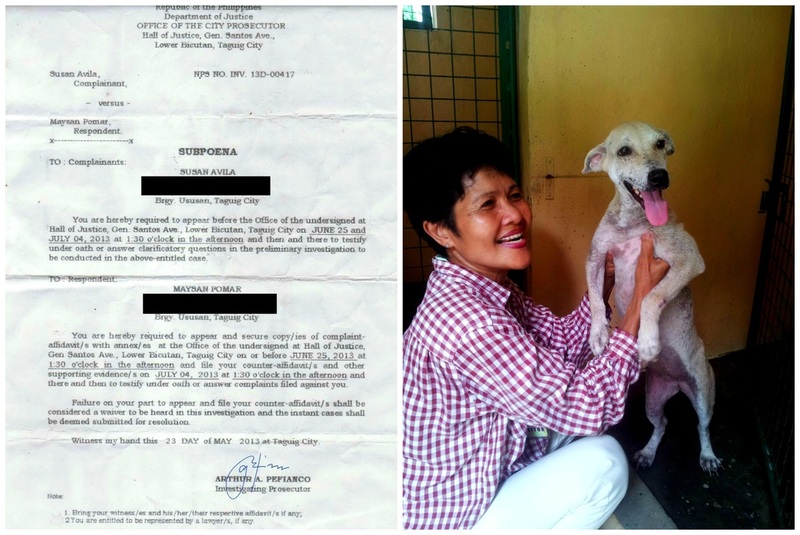 For Metro Manila cases, if you choose PAWS, please make sure you have submitted an affidavit first (link for Affidavit on Pet Neglect) because PAWS would want to be ready to file criminal charges in case talking with the owner does not work. For cases outside Metro Manila, please provide transport for the PAWS representative or call PAWS for guidance on how to file cases yourself. witness affidavit (click here for a sample in English) / click here for a sample in Filipino)- The witness affidavit is a document containing the FACTS - the details of the cruelty or neglect (dates, time of day, location, who committed the act, actions observed, etc). The affidavit must be BRIEF, PRECISE and leaves no room for doubt (in terms of the guilt of the neglectful pet owner). We need this in our possession prior to deployment because this is a supporting document in case we have to coordinate with the police to seize the pet and file charges. The police will not likely respond to animal welfare concerns unless we have a ready legal supporting document to present. YES or NO? -- Are you willing to foster or find a fosterer for the animal that will be rescued or confiscated from the owner? Fosterers are needed if and when a) the reported animal will be given up willingly by neglectful pet owner, b) the reported animal will be confiscated legally with the help of the police and with witness affidavit on hand, and c) the shelter is full and the reported animal cannot be admitted into the shelter. We knock on door or ask Barangay to knock on door to ask about 'alleged' animal cruelty or neglect. Owner makes some excuse that the neighbor was just exaggerating and explains that the animal is not being neglected or cruelly-treated. ...everything stops there without real proof of cruelty or an affidavit that helps us rebutt whatever explanations or excuses that the owner would have. Know that a warning letter from PAWS may not even elicit a response unless follow up letters mentioning the filing of charges is brought up. This is why we need the witness affidavit leading in case we have to proceed with filing criminal charges. Your identity as the informant is NOT REVEALED, AND IS KEPT CONFIDENTIAL during the initial stages (warning letter, ocular inspection). 3. File charges. Filing charges consist of executing an affidavit and swearing before a Prosecutor. We can help you do this (i.e. we will have your affidavit checked for free). No expense involved except for time spent, transport on both our parts. PAWS assists complainants in court cases. PAWS urges concerned citizens/animal lovers to be the proactive partners in promoting animal welfare by providing the necessary information, initiative to enlighten, intervene and/or take action and willing to come forward as witnesses in cases of cruelty, abuse, neglect and imminent danger. After one has assessed the situation and/or has talked to a neighbor/home association/barangay or has confirmed the neglect, we ask that you email complete details - what, where, when, who. As mentioned above, it is important to provide the name, contact # and address of the persons involved as well as your witness affidavit. We try to reply to emails in a timely manner (within 48 hours). Please remember PAWS is a volunteer-based organization with limited resources. More often than not, there are only a few people having to attend meetings and hearings, check email, take calls, man the shelter, assign and monitor activities of volunteers among other responsibilities which may or may not be related to the shelter. WHY DO I HAVE TO EXECUTE AN AFFIDAVIT? We cannot emphasize enough that without affidavit from a willing eyewitness, PAWS cannot go and threaten to file a case against stubborn pet owners. Please understand that making empty threats ruin credibility. Case cannot be filed without eyewitnesses willing to swear before the Prosecutor about their personal knowledge on the case. This is why we want complainants and concerned animal lovers to be ready with an affidavit so we can be ready for a court case if and when the animal offender calls us on this. Please accomplish an afffidavit so that we can have this ready before we call the barangay and talk with the owner. Please don't forget to give us the telephone number of your barangay officials. We will not need to use your affidavit if the animal offender or neglectful pet owner is cooperative and improves the living conditions of his/her pet. CASE SCENARIO #1: If pet owner was just ignorant and/or agrees to stop neglecting his pets and improves the situation of his/her dogs - then PAWS just makes a follow-up visit to ensure pets are no longer being neglected. Affidavit of concerned citizen is not used. CASE SCENARIO #2: If pet owner admits to the pet neglect and admits he cannot properly provide for the pets, and agrees to turn-over his pet to PAWS (depending on available space at the shelter OR if there is a willing fosterer already on standby) - then PAWS has pet owner sign an agreement that he is turning over his pet willingly, and that he will not buy or bring a pet into his home unless he can responsibly and properly care for the pet or else charges will be filed against him as a violation of RA8485 The Animal Welfare Act. Affidavit of concerned citizen is not used. CASE SCENARIO #3: If pet owner does not improve pet's situation despite friendly discussion, is defensive, ignores warning letter, denies that any neglect is happening, challenges PAWS to prove that he is neglecting his pet, challenges PAWS to sue him and file charges - then PAWS will not hesitate to file charges with the help of the concerned citizen who is a willing witness to the pet neglect. Affidavit of concerned citizen shall be submitted to the City Prosecutor's Office in order to file a case against the neglectful pet owner. Pet can be legally confiscated, but again, still pending space at the shelter or available fosterer. Using the witness affidavit and filing charges is the last resort if pet owner clearly will not cooperate. We do not want it to come to this and as mentioned, we always hope that the friendly approach by concerned citizens works. Many cases of pet neglect have been sorted out just by the friendly approach. 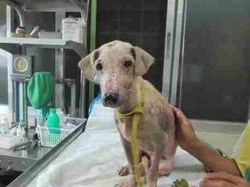 Shella - neglected dog in Taguig. STAMP OUT PET NEGLECT. SPEAK UP FOR THE ANIMALS. Shella's case is an example of CASE SCENARIO #3. CLICK HERE FOR SAMPLE AFFIDAVIT IN FILIPINO. PET NEGLECT (i.e., not providing adequate care, sustenance, shelter and medical attention or vet care) is a violation of RA8485 The Animal Welfare Act. If the ordinary concerned citizen is not willing to take proactive, concrete steps to help the neglected animal (friendly approach, submitting COMPLETE INFO and AFFIDAVIT), the pet owner will continue to do as he pleases and will not be held accountable for his actions. PAWS does not focus on rescues. Instead, PAWS focuses on EDUCATION, LOBBYING, PROSECUTIONS, SPAY/NEUTER CAMPAIGNS and VOLUNTEER EMPOWERMENT.